Austin Australia Cars Utilities Trucks Spares Oblong Sticker. 6.5". Austin Cooper S Sticker. 4". Austin Crest Logo Circular Laser Cut Self Adhesive Car Badge. 25mm. Austin Crest Window Sticker. 3.25". Austin Logo Circular Laser Cut Self Adhesive Car Badge. 25mm. Austin Longbridge Birmingham Stickers. 3.75" Pair. Austin Longbridge England Pale Blue Shield Sticker. 3". 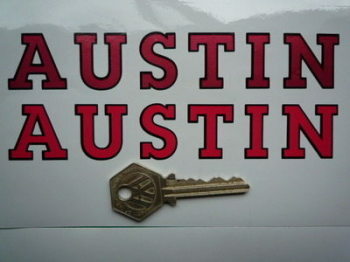 Austin Old Script Style Self Adhesive Car Badge. 3.5". 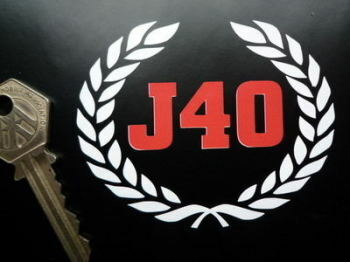 Austin Red & Black Cut Text Sticker. 6". 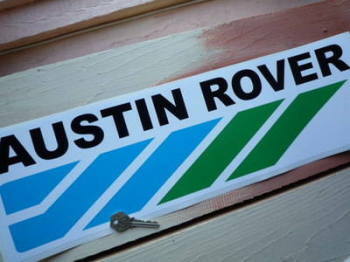 Austin Rover Racing Sticker. 14" or 20". Austin Rover Racing Stickers. 6" Pair. Austin Service Cars Truck Spares Workshop Sticker. 23.5". Austin Style Self Adhesive Car Badge. 2.5". Austin Text & Oval Stickers. 4" Pair. Austin Text Style Window Sticker. 6" or 12". Austin Winged A Circular Stickers. 50mm Pair.